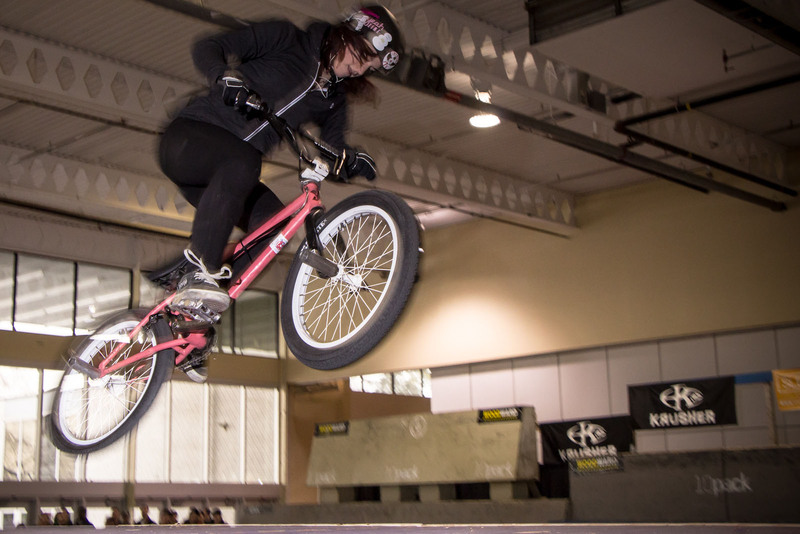 Kiera Bonifacio, above, launches her bike off of one of the ramps at the bike show this weekend past. Sibi, my four year old daughter, is just at the age where she’s ready to ride a bike. I feel my job is to get her excited about riding; to show her that cycling not only can get you around, but that it can be playful, adventurous, creative and fun. My partner first got excited about bikes by riding small homemade BMX tracks in his neighborhood. 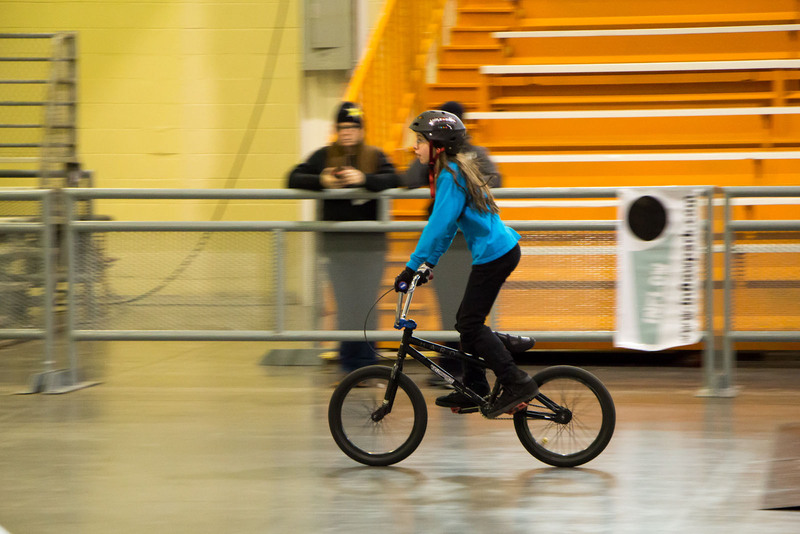 So this weekend, we went as a family to the Toronto BMX Jam at the Toronto International Bicycle Show, to check out some of the BMX fun. 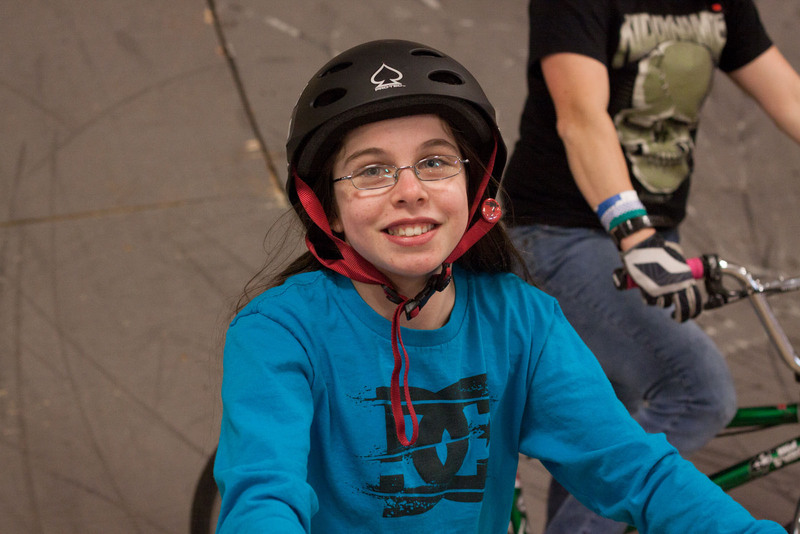 The opportunities for Sibi to see girls and women in BMX and in Toronto, though, are still pretty few and far between. BMX, in general, has had a bit of a bumpy go of things across the city in recent years, with bike parks having been removed and some residents claiming cyclists threaten green space and pedestrians. Practicing tricks is hard enough when there are no local parks; when you’re the only girl in the park, getting in some good runs can seem more daunting still, as BMX is still very much a male-dominated sport. Things are changing, though, thanks to local bike enthusiasts and amazingly talented young women who continue to excel and inspire in the sport. In 2012, the Wallace Emerson BMX Park was created as a result of local residents’ dedication, filling a void in the urban cycling landscape. This summer will (knock on wood) see the unveiling of the Sunnyside Bike Park, and will demonstrate ways that BMX can enhance, rather than oppose, Toronto’s green space. All the while, Joyride 150, a private indoor bike park in Markham, has been there to support BMX (and its women) by means of innovative programming and world-class facilities. 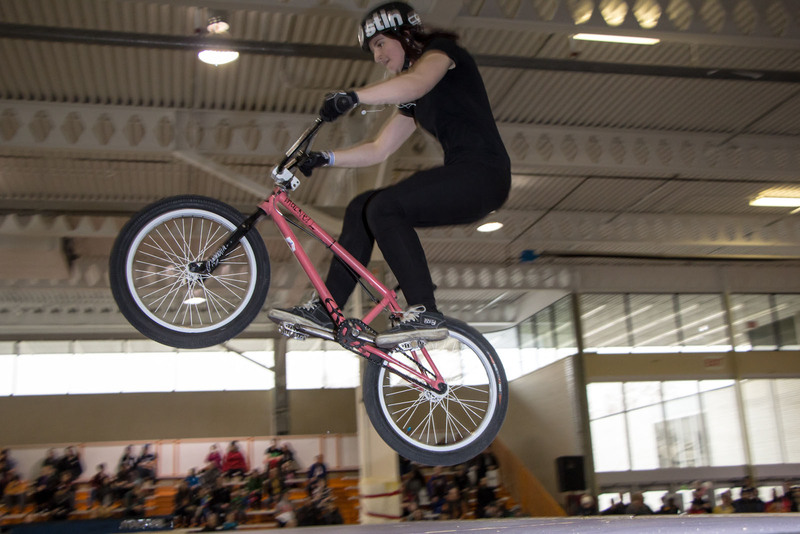 And the Ladies class at Toronto BMX Bike Jam consistently attracts many of the world’s best women and girls in BMX, including some, like Lily Melluso and Kiera Bonifacio, who call GTA their home. This year, Sibi and I were lucky enough to catch up with Lily and Kiera at the BMX jam. We had an opportunity not only to watch their jaw-dropping performances in the competition, but also to learn about their experiences riding in Toronto. 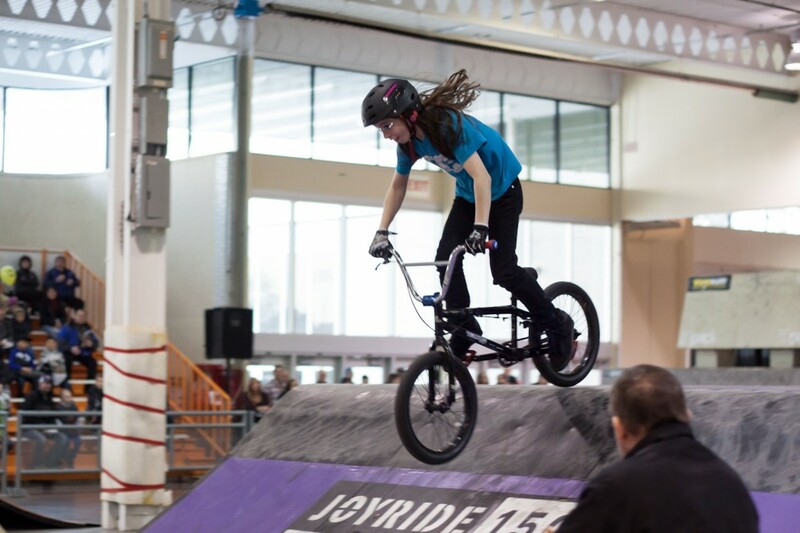 It's Kiera's fifth year at the Bike Jam and for Lily - an 11-year old rider - this year’s competition was her very first ever. Together, they capture the best of women’s BMX in this city today and the promise of what it can be, for all of the GTA’s boys and girls, tomorrow. Thanks to them both for inspiring my daughter to make this her year to get out and ride. Sonya/dandyhorse: How long have you been in BMX and how were you introduced to the sport? Kiera: I think this will be my fifth year. I got introduced to the sport through my brother. He was riding bikes ever since he was a little kid and he's been coming to the metro jam for nine, ten years. So I'd been coming here as a spectator. I originally was into a lot of sports, but then I moved away and when I came back I didn't have the extra funds to do extra curricular activities. So my brother's girlfriend, who is also a BMX rider, sold me her old bike. I spent my $200 and rode at the local skate park for free. Sonya: You're from Toronto originally? Kiera: I'm from Oakville. The local skate park I started out at is called Shell Park. That's a public, outdoor park. It's skateboards mostly. I don't think they allowed BMX, but it's both, really. There’s a bowl and a box jump and a five-foot quarter, some banks and stuff. It's got a lot of different obstacles, all basically what you see in the jam there, maybe a little smaller scale. Sonya: What are your favourite places to ride now? Kiera: Currently, because it's winter, we all truck up to Joyride 150 in Markham. I live in Toronto now with my boyfriend but (Joyride) is about an hour by transit, and a twenty minute drive. It's huge, like 90 to 100 thousand square feet … and for bikes only. They have pump tracks and box jump runs and a big vert park and a small street park. I used to do (Inflow Bike and Skate Park) a lot more when I lived in Oakville and had a car. We'd drive over because it's in Dundas, so it's a little harder to get to by transit. But it's nice as well. But then in the summer time, in Toronto, we hop from park to park. Cummer and Wallace and everything. Sonya: What do you think of the new Wallace Emerson park? Kiera: I worked there last year. I taught kids how to ride, so that was fun. It was an extra-curricular summer program. I was employed by the City of Toronto to teach BMX. That was really cool. I love Wallace, they've got a dirt track; it's really nice how they built it especially for BMX. Because they realize there are parks (Ashbridges, Cummer) around Toronto that are skateboard only. We get a lot of heat going there sometimes with our bikes. It's nice to have our own park. Unfortunately, it's small and it's the only thing that there is. Sonya: What age range were you teaching in the Wallace summer program? Kiera: We had boys and girls from the ages of 6 and up to about 16 or 17. Some of the kids we were teaching to ride BMX and do tricks and stuff but some of the kids we were actually just teaching them to ride a bike. I think I taught 4 kids to ride a bike that summer. Sonya: Have you been to the bike park in Regent Park? Kiera: I'd don't go there too often, it's far. Sonya: Is there a need for parks solely dedicated to BMX? Kiera: There are some functioning shared parks. You can have a 'street' style park or a 'park' style park… like the quarter pipes and the box jumps and that kind of stuff. You can have both and/or you can integrate them. But then, a skateboard park tends to have a lot of smaller obstacles. I kind of tend to be geared toward the bigger stuff on my bike. Sonya: How do you meet other women riders in the city? 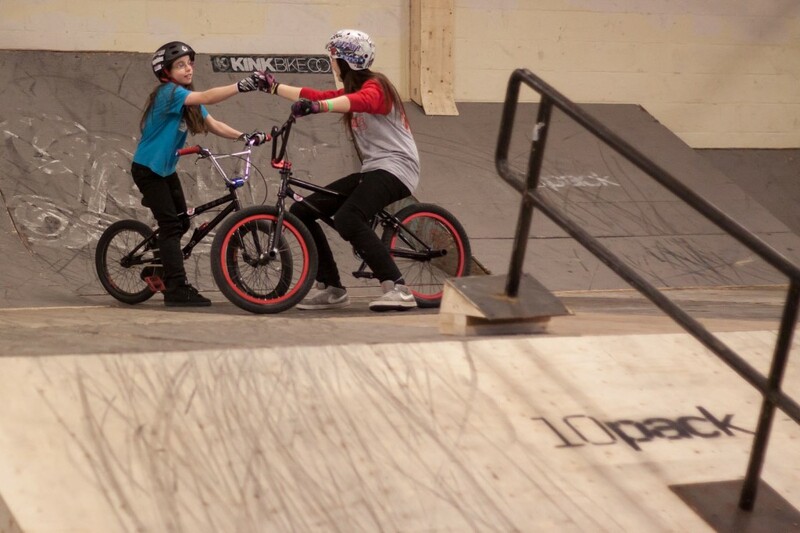 Kiera: It's easier to meet more girl riders at Joyride 150, because it's a sheltered environment and there are people who are looking after you. Whereas, a skate park in downtown Toronto can be kind of intimidating for a girl to just go and ride. So Joyride 150 is definitely a good place for girls to go and meet. At the Toronto BMX Jam I've met girls from other areas. I've met more than a few girl riders at Joyride. Sonya: I see they have a Women's Weekend at Joyride, were you there? Kiera: I was at Women's Weekend, it was February 17 or something like that. 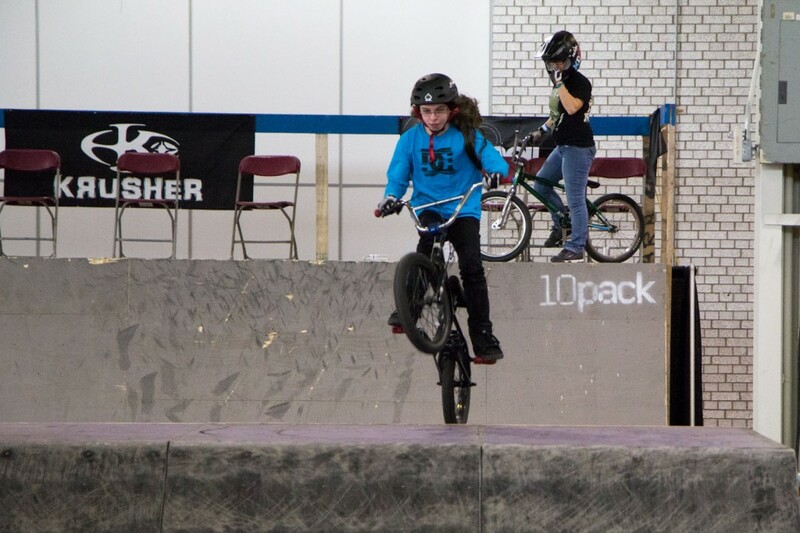 I was also at trainer that weekend, getting to meet a lot of girls in different varieties of biking; some girls who do trials or racing, then hop on a BMX. They come meet me at the park and I show them how to air a quarter or how to fly out. And that was really neat. You do a little bit of networking there for sure; it's great to bring the girls together to have a group session, it's neat. Sonya: What's your favourite trick? Kiera: Well I will tell you that fakies [riding backwards and turning] were my hardest to learn. I guess those make me feel best when I do them because I know how hard I worked to really get them. So fakies or 180s … both are really fun to do and they were difficult things to learn, for sure. I'm working on 360s now; they are coming around. I'm getting pretty comfortable with them. At Joyride they have a foam pit, so I've tried backflips into foam pits and stuff like that. Sonya: How do you think we can make the GTA better for BMX? Kiera: What would be really great would be an indoor bike park in Toronto. That would be ideal. It doesn't have to be big, like Joyride; it could be smaller. We used to have one; I guess it was called the Warehouse. We also used to have one called Rail City. It was much better back when my brother was riding. They would hold competitions there, too. What would also be really great is a nice, [outdoor] concrete bike park - just a nice bowl with a little extra stuff on the side. I know Oakville and Burlington have been building these up; I don't see why a city like Toronto is so quick to resist. There were also those dirt jumps in High Park that got shut down. It would be nice to have another dirt track around somewhere. We pay a lot of taxes so I don't see why not. Sonya: What about including a bike park in waterfront renewal efforts? Kiera: Absolutely. Definitely the downtown waterfront is always a great place to ride, because it's clean and it's an attraction; you'd bring people to your city because they want to ride in this great park. I've seen the California waterside, ocean side bike parks. It's really neat stuff. Sonya: What are ways to get more women involved in the sports, more girls? More women-centred programming? Kiera: Girl focused classes are great. Maybe BMX isn't the sport for every girl out there but you can definitely put it into summer programs, like I was doing at Wallace. I don't know if there're enough girls that have the interest so we can make a class girl focused. But definitely we should have girls, or women, as instructors. Once you see someone a little bit older who's able to do BMX and who’s having fun, that sort of plants a seed for the younger generation. I think that's where we need to start. Women-only hours are cool; I think those are really neat. That's what's great about the ladies class in this competition, too; if we didn't have the class for the girls, we’d have to ride in the amateur class with the boys. Sonya: I notice the Flatland competition at the Bike Show does not have a ladies class. Sonya: Are you sponsored in this competition? Kiera: No I'm not sponsored. I've never really been sponsored. Inflow offered to pay my registration for my first year. I don't ride to get sponsored. I'm in school for massage therapy, I have other goals in life … I ride to have fun and I ride for the kids. I would love to see a lot more girls riding. And the fact that Perris from Nevada is here and Hanna from Milwaukee; I'm really stoked. It's exciting to see more girls. It's unfortunate that it’s Canada … that BMX doesn't get the light it deserves and with women, it's even lower. You have Angie in Carolina … it's bigger over there for the girls. Like, at Ray's Weekend, at another Bike Park in the States, there are way more girls. Sonya: Do you use a bike to commute? Kiera: I ride a Redline single speed. I work downtown at Blue Jays Way and Wellington and I live at Davisville and Yonge. I also commuted during the summer to Wallace Emerson. Up down, up, down, up. I come down Yonge, turn right on St. Clair, left on Avenue, right on Dupont and then go straight down to Wallace, which is at Dufferin and Dupont. I ride back up the same way. And then, when I go downtown, it's the same sort of situation only when I’m on Dupont I take a left on St. George past U of T. It’s a beautiful commute, I love it. More bike lanes would be great, especially on Yonge Street. It's a scary street, especially in the morning when you are trying to get by. I don't like riding on College Street because on that one part with bike lanes there are so many bikers. Sonya: Have you tried with your BMX? Kiera: I've done the commute on my BMX too. It's a lot more work! Especially going up. Oh my god, Summerhill? Don't even get me started. Sonya/dandyhorse: How did you get into BMX? Lily: I went to summer camp at Joyride 150 and I really liked biking so I bought my own bike and got a membership. And I now ride every day. Sonya: How long have you been riding? Sonya: What are your favourite places to practice? Lily's dad: (Joyride)'s a safe environment for Lily. I don't mind dropping her off there; I know that they look out for her. We just sort of came across (the summer camp) and that's when it really took off for her in terms of wanting to go there all the time. Lily saved up all her own money; it was all spent on this bike. Lily: The bike was like $400 and I got a bunch of new parts to make it lighter. I wouldn't be able to clear big ramps or do good tricks; it's just harder with a heavy bike. Sonya: How old are the kids in the Joyride camp? Lily: 5 to 15 or so. Sonya: Wow, a 5 year old ride a BMX? Lily: They can ride a Strider bike or with training wheels. Sonya: You can take a Strider bike on the quarter pipe?!? Lily: Nooo. They ride in the beginner area, with the "little rollers". Sonya: Who inspires you to ride? 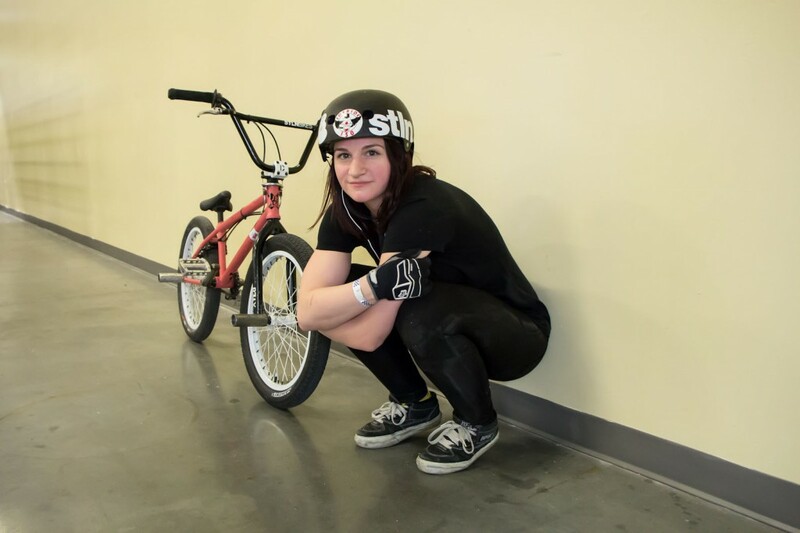 Lily: Drew Bezanson's really inspiring. He is my favourite rider. Sonya: And your favourite female cyclist? Sonya: She's one of my favourite's too. Is Joyride where you go to meet other girl riders, then? Lily: Well, there are not many girls in BMX. They mountain bike more. But I think at Women's Weekend at Joyride, that's when you meet lots of girls. (Women's Weekend) is where, for half a day, it's only women riding and you have instructors come in (for the women). I met Kiera there. Sonya: Do you ride a bike in your neighbourhood? Lily: No I always leave my bike at Joyride, I store it there. Sonya: Do you ride in the public parks in Markham? Lily: At Markham skate, but I don't really go there that much. Lily's BMX buddy: It's for skateboarders only, but everybody rides there. Skateboarders, bikers, even rollerbladers. Sonya: Are there other public parks where you go and ride? Lily: Yeah, there is Centennial skate. It says no bikes, no skaters, but people ride there anyway. Sonya: How do you think we can get more girls into BMX? Do you think women-only hours at parks make a difference? Lily: It's fun with boys and girls, and it would be fun with just girls … but there's not very many girls. Sonya: What about more female instructors? Lily: At Joyride, the instructors are boys and girls. At camp, the instructors are all boys. Sonya: Would you want to be an instructor? Sonya: How about competing, are you enjoying the Bike Jam? Lily: Yeah, it's been really fun! Sonya Allin is an adjunct research scientist at the Toronto Rehabilitation Institute. She bikes with her daughter Sibi from the west side of Toronto to Sibi’s downtown school, and then to work, almost every day. Robin Sutherland is a former Toronto bike courier, a photographer and graphic designer from the Rama First Nation. He also hand prints t-shirts at home and by hand, some of which he sells at Toronto craft fairs or atLittle River Crafts.